Deputy Registrar - 3 Posts - Basic Pay 15600 Academic Grade Pay 7600 in Pay Band III category - Post Graduate Degree with 55% marks with 5 years experience as Lecturer / Assistant Registrar or 10 years experience as Chief Superintendent / Assistant Registrar. Last date for apply DR post is 7th August 2015. 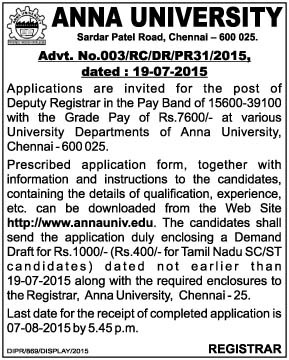 "The Registrar, Anna University" payable at "Chennai"